Olive Wheat Grape is a casual-dining restaurant. Located at Prabhat Road, Erandwane in Pune, it serves Mediterranean Cuisines. 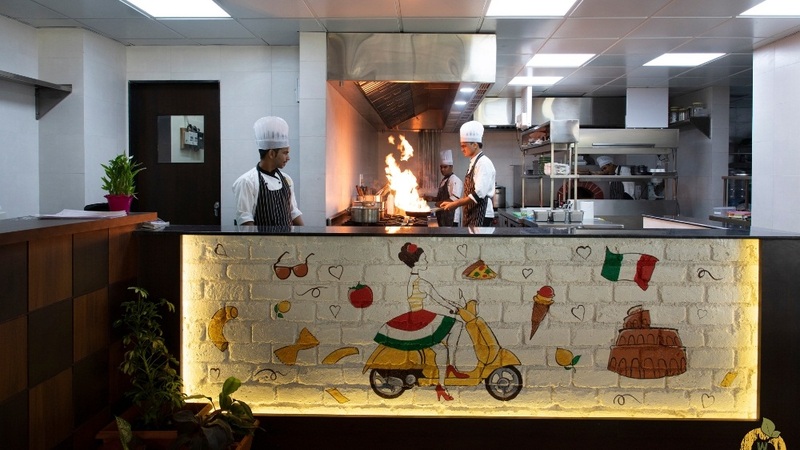 While visiting the site at Erandwane in Pune, Nilesh Limaye, the Consultant Chef for Olive Wheat Grape restaurant, says he was stunned by the location. “It opens into a very important junction of Pune. This area invites my childhood memories because we stayed nearby. The feeling of ‘apna ilaka hai’ absorbed into me… I wanted to create something for my city which I had learnt all these years. “A lot of youngsters travel or reside in Europe or the US. They visit their hometown at least twice a year. So it’s a perfect time to give something very upmarket and classy to my city,” adds Chef Nilesh. The interiors of Olive Wheat Grape restaurant are open and sunny. It’s an open concept with live kitchen. It also caters to indoor seating where the guests get a feeling of sitting right beside the busy street; the diners can just admire and incite their memories as the city drives by while the people outside when they see the restaurant, would want to enter and feel the warmth. The Restaurant’s name is Olive Wheat Grape. Grape is very important for Mediterranean food and is considered next to God. The Mocktails at the restaurant is the ‘Grape’. “The drinks are very important to us be it mocktails or cocktails,” Chef Nilesh Limaye. The restaurant is keen on attracting non-drinkers with its mocktails. Replying on what developed his interest in focusing the non-drinkers, Chef Nilesh tells being a dry state, the barmen at Ahmedabad restaurants would flash making mocktail just like a mixologist or a barman would do while making a cocktail. “That attitude really clicked”. “The non-drinkers usually end up calling for iced tea or a mocktail. Sometimes, they feel that spending money on a drink is a waste. My main focus is to make the mocktails Instagrammable; that is the first approach. I also make sure to add good colour combos to attract the diners,” says Chef Nilesh. Olives are considered close to purity. Keeping the Indian culture on mind where people like to share food, Chef Nilesh has kept tapas as well but “I didn’t want to put the Tapas as the word”. That’s why he calls the starters under Olives - the icebreakers. Anything like pizzas, pasta, comes under wheat. Olive Wheat Grape serves modern ‘trendy’ food. Be it pasta or kulcha, people in India like spicy food. “I have been to Morocco, Marseilles, etc, covering the Mediterranean region. I felt the food there is very much similar to ours. They believe in seasonal vegetables, sustainability and freshness. Their cheese is also fresh. They are so much proud of their food and produce. Even in India the regional cuisines are very much appreciated by the locals. The vegetable or farmers’ market is still held in Pune/Mumbai,” says Chef Nilesh. There is a lot of similarity between the two cultures. The restaurant is using the local produce but it is also using polenta or couscous to give a Mediterranean touch. The food will be served in the Puneri style; the restaurant may not add the Goda masala in its cuisines but will serve Mediterranean food that goes well with the Indian palate. The restaurant’s focus is on serving good food rather on the decoration. The presentation has been brought about by using earthenware and tagine pots and serving water in a brass/copper bottle. The ambience of the restaurant might not be sophisticated but it’s elegant – a simple décor with more white shades. It has a straight walk-in kitchen; people can see what things are being cooked, they can talk directly to the chefs. If possible, chefs can try and customize for guests. It is a relaxed casual-dining place. In Pics: 8 Newly Opened Restaurant In Pune You Need To Try Right Now!